A fire is the second leading cause of property damage. It is one of the most dangerous and traumatic experience many will ever have to go through. At AZ Environmental Contracting, we make it our priority to get your home or business back in order. Leave it to the professionals. We have plenty of experience and ability to get the job done fast. 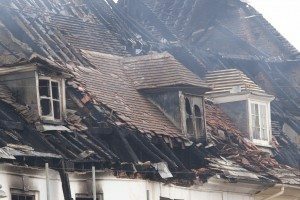 Our team will start by surveying the building to determine what can and cannot be salvaged. Once the area is cleared, we will begin cleaning up the ash and other debris. Metals and glass may need to be replaced depending on the severity of the damage. Once the cleaning is completed, we treat the odor with highly specialized detergents or deodorizing fog that nullifies the smell of smoke. Any items that can be saved are sealed to prevent further contamination and spread of odor. Act Fast! It only takes minutes for ash discolor appliances and other items in a home or place of business. Immediate cleanup translates to minimized cost of repair. AZ Environmental Contracting is available 24/7 in the event of an emergency, so don’t hesitate to speak with one of our representatives immediately. Don’t wait until it’s too late. Contact AZ Environmental Contracting through our web form or call 623-734-5536.